Hi everyone, I’ll keep this post brief but I wanted to let everyone know that I’ll be doing another 24-hour Extra Life gaming marathon on November 5th, 2016. I’ll be gaming for 24 hours straight, and live-streaming my marathon on Twitch. I’m hoping to raise $1,000 for my local children’s hospital and I need your help. Click on the link above to see all the details. 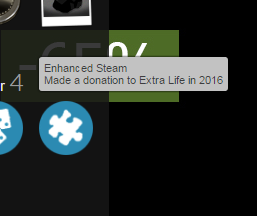 For donations of any amount, you get a cool Extra Life 2016 “Enhanced Steam Supporter” badge for your Steam profile. Additionally, we’ve teamed up with IsThereAnyDeal.com and GamesPlanet.com to give away tons of games during the live-stream. There are some great games up for grabs such as Doom, Dark Souls III, Deus Ex: Mankind Divided, Football Manager 2017 and more! Just put your Steam profile link in the note with your donation to be eligible. Let’s show people that gamers like us can be a force to be reckoned with. Thank you in advance for whatever you can give, and be sure to tune in on November 5th for the live-stream. See you there!